Foam can be found in your home's mattresses, furniture cushions, pillows, carpet pad, and clothing. Recent studies found that the flame retardant additives in traditional polyurethane foam are linked to cancer. If you ever tour a typical polyurethane foam factory, there are large signs at the entrance that warn "there are chemicals used in this facility known to the state of California to cause cancer." The foam in your home is a critical component to address in creating a healthy home. You can replace many of these items with a natural foam: latex. 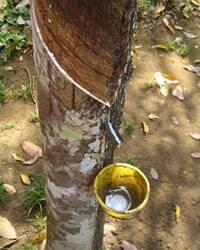 Latex foam is certified all natural foam rubber that is manufactured using sap from the rubber tree. The tree is tapped and the milk from the tree is collected in a bucket similar to the way maple syrup is collected from Maple trees. Natural latex foam has inherent dynamic contouring properties make it ideal for exercises, cushions, pillows, and much more. It is naturally resistant to bacteria, mildew, and mold. This high-density natural foam rubber—almost 6 lb/ft3—will last up to 30 years when properly encased. It will biodegrade in a few years when exposed to the elements, completely turning to dust. 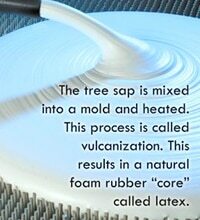 Our latex foam is certified 100% natural foam. It contains 97–99% natural tree sap and the remainder is composed of natural soaps and residuals from the manufacturing process. Natural foam has naturally occurring flaws that include small air pockets, discoloration, small tears, uneven surface textures, and holes that don't go all the way through. 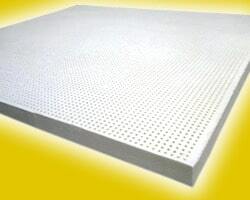 28" × 52"38" × 75"38" × 80"53" × 75"53" × 80"60" × 80"72" × 84"76" × 80"
Here you have the option to purchase natural latex raw foam blocks that are manufactured in standard block sizes (or, we can custom cut a particular shape and size for you, below). Choose from Soft to Extra Firm grades. All foam rubber blocks come 5.75–6.25" (15–16 cm) thick. Blocks of 72"×84" are seamed. You can sometimes save money by purchasing the entire block and pay our cutting fees ($10–$20/cut) compared with ordering a custom size piece. Compare both methods to see which is more economical for your application. This natural foam rubber is heavy and will likely tear or become dirty when it comes into contact with different surfaces. We strongly recommend you purchase a case for all natural foam. You will be given the option to choose from a variety of organic fabrics, Sunbrella®, or discount fabrics. You can even send us your own fabric; visit our custom sewing page. The benefits of having us sew for you are one-stop shopping convenience, excellent sewing, and we will be responsible for the entire finished product—no finger pointing because of misfit covers: "It's the seamstress's fault." We sew the cases inside and out so they won't unravel when cleaned. We can also pre-wash/pre-shrink your fabric selection. All covers are made with a zipper for easy removal and cleaning. Want matching pillows for your creations? We can sew cases and provide the pillows using your left-over fabric. Natural latex foam is an ideal alternative to polyurethane (oil based) foam or soy-based foams that imply they are all natural. Soy based foams are only 5–35% soy based and the rest is oil based derivatives and contain flame-retardants. Please click on the shape below that matches the shape you would like to order. Next you will be asked to enter in the dimensions, and after that you will be given a price quote on a range of qualities. If you need help measuring, there will be a link above the shape, on the next page, that will explain how. You need to decide if you want a flat modern looking cushion (without any cotton wrap) or a "crowned or full" style cushion (cotton wrapped). If you choose no wrap then you should order your foam 1/2" (1.3 cm) thicker than its cover's boxing (see instructions on next page), otherwise your cushion won't fill out your cover, showing wrinkles. You can begin entering dimensions by clicking on a shape below, or continue reading below the shapes further details of natural foam rubber (which we strongly recommend). Warning: Individuals with latex allergies should use caution with Natural Foam. Spot clean natural foam rubber with mild soap and water. Know how the fabric can be cleaned beforehand, so as not to treat it in ways that could cause it to shrink. If the natural foam rubber is put into direct sunlight or exposed to air for several weeks, it will begin to dry out and become brittle. If your natural foam becomes wet, remove the cover and let the components dry separately in a room. Check our clearance section for discounted natural latex foam blocks. It is our mission to make our customers' lives more comfortable and stylish by viably conducting business with integrity, quality, and competitive value. It is our commitment to promote sustainable and healthy products and inform consumers of the risks of conventional foams used in cushions and mattresses. Natural foam blocks may be returned in new condition. See exact details during checkout. There's a lot of talk these days about switching to organic cushions. Why not change out your old foam for new organic cushions? One reason to switch into organic cushions is that they don't contain fire retardants. Our organic cushions are completely biodegradable. After you have used one of our organic cushions for years just throw it in the trash. What are organic cushions anyways? Our organic cushions are made with a core of natural latex foam. Use layers of latex foam to build the ultimate organic cushions. Use a bottom or middle layer of firm latex foam and the top and bottom soft. The batting around our organic cushions is a certified organic wool and the fabric around our organic cushions is certified organic cotton. Organic cushions can be used can be used in dog beds, sofas, changing tables, and pads. These are not certified organic cushions. Certified organic cushions by our standard would be made of only certified organic components. It's important to realize that even though our foam is natural it doesn't mean it may be used to make certified organic cushions. In fact as mentioned earlier many customers with sensitive sniffers are surprised how much they don't like the smell of our latex foam. So currently the only way to make certified organic cushions would be to use an organic cushions fabric such as hemp or organic cotton and you could fill it with an organic cushions stuffing such as kapok, organic cotton, or organic wool. I recommend getting samples of each of these types of filling we can use in organic cushions prior to ordering to make sure your not allergic. We can build organic cushions to these standards but there would be a cost to modify them and there would not be any refunds if you were not satisfied with the final product. The problem with making organic cushions from these materials is they will flatten out. Organic cushions built like this and used for the back or throw pillows would be better suited for the materials we are speaking about here. Organic cushions are more costly than our other foams but worth the health benefits. Thank you for choosing our to read about our organic cushions. Anecdotally, there is a woman on you tube who eats her sofa foam. Will someone tell her it would be healthier for her to eat one of our organic cushions made with latex foam? We replaced the foam cushions. They feel like new. My wife can't believe the difference. The cushion ordering was easy, following the instructions on the website. Measuring was easy, ordering easy and delivery fast. I highly recommend this company.